12 tortillas (corn or flour), 5 or 6-inch dia. Prepare baking dish by lightly greasing the bottom and sides. In a skillet, brown the ground beef and drain off the grease. Add the mushroom soup, water, oregano, chili powder, and half the package of fajita seasoning to the ground beef and stir to mix well. Bring this mixture to a boil; reduce the heat to low and allow to simmer for 5 minutes. Remove from heat. Cover the bottom of the baking dish with the tortillas. Tortillas can overlap slightly but tear them in half or pieces cover the bottom the best you can. A little overlap is good. Spread 1 cup of the meat mixture over the tortillas, spreading out as evenly as possible to cover the tortillas. 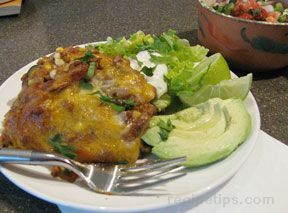 Continue to add layers of tortillas and 1 cup of the meat mixture until you have 4 layers of tortillas. 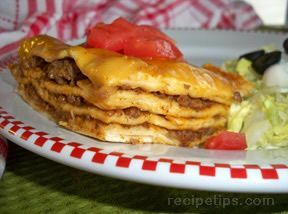 The top layer should be just tortillas without any meat on top. Mix together the cheddar cheese soup, milk, and the remaining half package of fajita seasoning; stir together until smooth and well mixed. Spread over the top layer of tortillas. Bake at 350° F. for 30 minutes. Remove from the oven and let stand for 10 minutes before serving. Serve with all your favorite toppings, such as shredded lettuce, chopped tomatoes, green onions, black olives, sour cream, salsa, and guacamole. 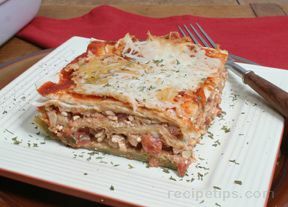 "I didn't know for sure if this would be very good when I was making it because it seemed like it had too many layers of tortillas but it was really good. My wife liked it too. 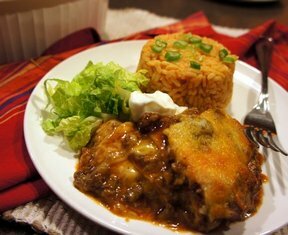 We served it with shredded lettuce, sour cream, chopped tomatoes, and black olives."